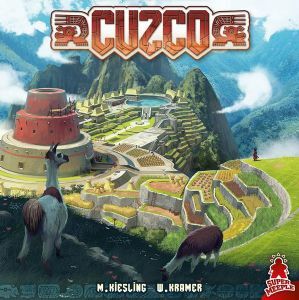 CUZCO is our third installment in the trilogy of the masks of the famous authors Mr. Kiesling and W. Kramer. This is the new edition of JAVA, which was published in 2000 between TIKAL and MEXICA. Once again, we have taken a particular care to the material and design of the game for your enjoyment. 'Cuzco' replaces the name 'Java'. Indeed, during its first edition, the name changed and the place had moved to Indonesia in the island of Java. It seemed logical to put back to play its original name desired by the authors and to put it back among the other peoples of ancient South America! After the people of the Aztecs of MEXICA, the Mayas of TIKAL, here we are with the Inca people in CUZCO. Incarnating Inca dignitaries, you and your clan will come to the CUZCO plateau in Peru to build the city, erect temples and make offerings to the gods to gain prestige and become Emperor of the Inca people! Cuzco is a strategic game that combines the placement of tiles and characters. To earn prestige points, players will have to create villages using these tiles, place the members of their clan to be the majority and build, then enlarge temples. One of the original features of CUZCO lies in its majority principle. Indeed, it will not be necessary to have the most characters to be majority, but to have the most senior character in a village. This principle requires players to stack the terrain tiles to be at their maximum height. Once, the tiles placed, the movement of the characters and their position on the field will be of the utmost importance to try to maintain this majority until the end of the game for the grand final count. These tile placements and temple construction will give CUZCO a great look as the game progresses. Like Mexica and Tikal , players have a capital of action points each turn. These points can be divided into various actions, the first, mandatory, is to put a tile on the board. Other actions can bring a character on the board, move it, rest other tiles, build temples, enlarge them, create irrigation ponds, draw holiday cards and finally organize a party in honor gods by offering relics on the cards. The players will have to optimize each shot to win the victory to form the field and position themselves at best. In general, each round brings victory points, but it will also anticipate the end of the game, where the final count brings the most points of prestige! The creation of irrigation basins will offer a second alternative axis to quickly capture prestige points. It will be enough to lay water tiles, surround them with land and be the majority to gain 3 prestige points per tile water forming the basin. But beware, their number is limited and the race is committed to whoever will ask them first! Of course, we focused on the quality of Cuzco, just like the first two parts of the trilogy. Thus, the characters have a nice shape, the tiles are thick to distinguish the different heights of terrain, and as usual, our temples are resin to bring a beautiful immersion and a superb design to the game. Finally, a large plateau in six parts will complete the whole! 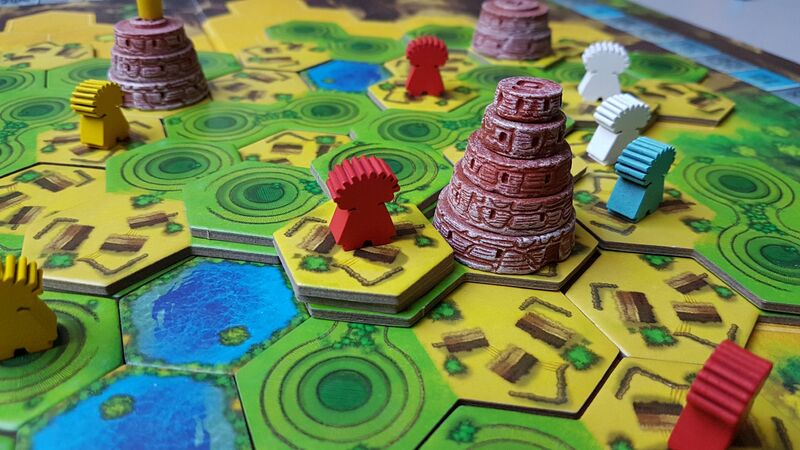 First the players explored Tikal, next they developed Java, and now they can help build Mexica.